New York artist Van de Roer’s portraits have the bleeding effect of images prematurely exposed, except they’ve neither been X-rayed nor sun-seared. 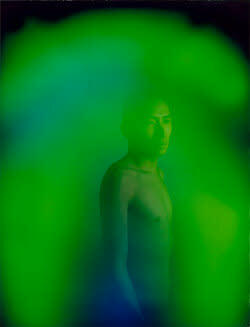 For the photographs on view at M+B, Van de Roer used an Aura camera, the photographic equivalent of a mood ring. Manufactured to use Polaroid film, it was designed in the ’70s by the pseudoscientist and engineer Guy Coggin to, in theory, “show” psychic energy by surrounding a subject with a blurred halo that reflects both the subject’s essence and the world’s perception of it. Not many of the early machines exist, but Van de Roer found one on eBay. 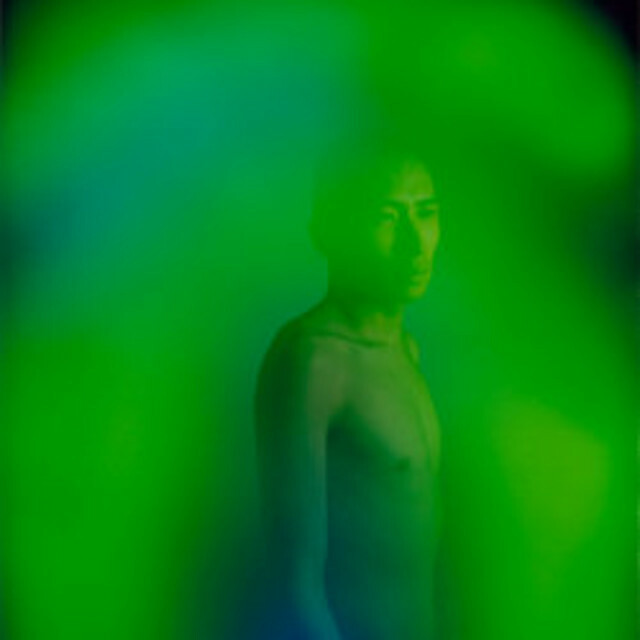 He calls it “The Portrait Machine” because it’s uniquely suited to exploring portraiture’s typically knotty subject-artist-camera interplay. “The cameras are riddled with ancient wires, and the hand plates are what make the process innately uncomfortable” for the subject, says Van de Roer, who places his subjects’ hands on metal sensors in a way that gives their poses a certain 19th-century stoicism.